When a little boy gets tired, he could take a nap on the couch. 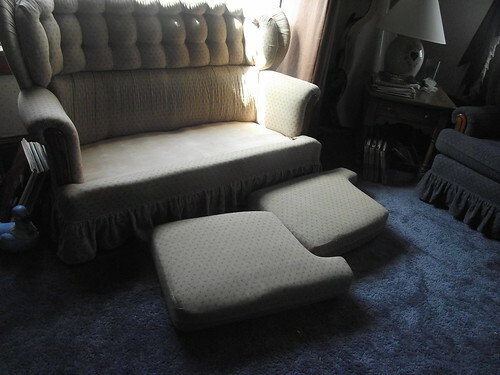 Or he could take the cushions off the love seat and take a nap on them. 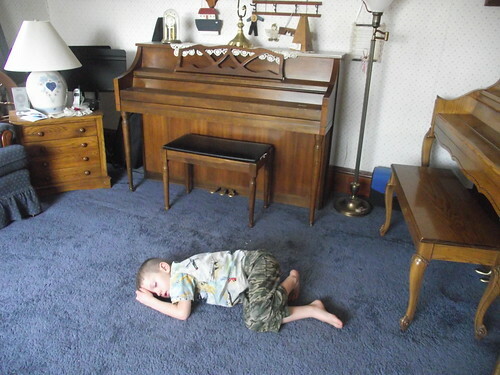 But instead, a little boy was sooo tired, he took a nap here! It’s Still Coming….But WHAT IS IT?! Could it be a blog makeover? A wonderfully super-duper post that is just going to inspire the socks off everyone?! THE answer to all your problems?! ALL or NONE of the above??!! Don’t you just hate it when people tease like this?! Wal-Mart and Meijer’s have lists from the local schools. Pencils. Pens. Compass. Crayons. Scissors. Glue. Calculator. College ruled paper and notebooks. Binders. Organizers. School boxes. Backpacks. Not only that, but there are back-to-school sales on clothing and shoes. Don’t new clothes and August go together? We can’t forget snacks! Especially for the college students! But what about the poor, deprived homeschoolers? I confess I used to stock up on "school supplies" every August. After all, there was an abundance, and sometimes you couldn’t find certain things later in the year! And there are always good sales–Meijer especially is good about having something really super duper cheap each week. But not anymore. I usually am still letting the budget recover from 4-H fair time by August! Then there’s fruit to buy for canning and canning supplies. Plus, we seem to have amassed most of the gadgets we need and lots more we don’t need! I buy more paper and clear-view binders and page protectors than anything, and the stores always have those now. So what do homeschoolers do? They ask for it all for Christmas!!! At least that’s what my younger children are doing!!! I mean, think about it—pencils, pens, crayons, calculators……aren’t they the perfect stocking stuffers?! And just wrap up some snacks, some new clothes (my littles are asking for homemade blouses, jumpers, slips…! ), and voilà! Christmas on a Back-to-School budget! A friend on the Mommy T-Tapp Forums was relating how her children spilled a whole quart of honey! She mentioned it all over the table, the floor, in hair…. And it jogged my memory of a poem I wrote a looooong time ago (I think around 1993, 94 or 95!!) when once my girls spilled a little honey, and then we all got silly "wondering" what would happen if…..
if there was honey everywhere? and even in your hair? And dripping off your nose. and squish! between your toes! and on Mommy’s sewing, too. is covered with this goo. on the couch and chair. and going down the stair! and honey on our beds. and honey on our heads. and even in the sink. Oh, what a mess we have! Hope that brought a smile to your day! I received this from a friend and my daughter and I laughed until we cried! I hope you enjoy it, too! In case you’re visiting and you hear The Irish Rovers singing "The Unicorn Song", I want to let you know that I don’t believe in the mythical unicorns, nor do I think Noah had to gather all the animals! But the song is one from my childhood, and I just couldn’t resist! Some of my dearest friends especially might have been worried about me! LOL! to be my special field of duty." The Lord Has Blessed Us With…. We were supposed to start "school" today (whatever that means! ), but instead, my youngest 7 yodd has broken out with chicken pox! And none of the other children have had it, either! Sooooo…the next few weeks could prove to be quite interesting! Of course it still counts as learning. All about infectious diseases (health, science). The immune system (science). Herbs and vitamins to help the immune system (naturopathic and botanical medicine). What to do to relieve itching (thinking skills, science, health, medicine). I think I should be able to get my medical degree by the time I’m done raising kids! Or at least my "children’s health practitioner" degree! And now my 22 month old son just came in from playing in the ashes in the fire ring. I’ll have to get a picture and post it! War paint, anyone?! Wonder if he ever climbed the Mountain of Laundry, or braved the terror of "Getting Through the House Without Falling and Breaking a Leg on the Stuff on the Floor"?! Of Archaeological Digs, Spinning Yarns, and Cheap Therapy! Well, I’ve already broken one of the rules for blogging–regular entries!!! I never did promise that, but I did think I’d be back before a month was up!!! We are "undecorating" the house today. BLEH! It’s never as much fun as decorating! I told the girls we should have decorations for every season, then it wouldn’t be so bad! Well, my sweet husband might disagree–finding a place for MORE Rubbermaid tubs wouldn’t exactly be a picnic! I need to unearth the bar again (not quite an archaeological dig this time, but it’s getting close…) before we start giving music lessons Monday. I think it would be easier to keep the bar clean if my computer desk were more organized. But to organize that, I have to clear out the filing cabinet in the sewing room, and to do that, I have to find the sewing room (major archaeological dig). And I can’t really work heavily on that in good conscience until my part of painting the new master bathroom is done so I don’t hold up progress in there for my husband! In the meantime, the bar will be an ongoing struggle! Winter months are supposed to be slower, more time at home because of the weather, time for "piecin’ quilts" as a neighbor of long ago used to tell me! Somehow, we’re not as cabin-bound as in the "olden days", life doesn’t seem to slow down much, and I’m not piecin’ any quilts. Sounds good about now! I think the modern woman has gotten ripped off. I like many love my appliances and modern conveniences, don’t get me wrong. But it seems to me that the creative part of our homemaking has been taken out of our hands–it’s just easier/cheaper to buy such and such vs. making it. Then in its place we get the laundry, the sweeping, the dishes, the bath to clean (and more of them! ), the this and the that…..all of it a bit easier now-a-days, but we lost something. We lost the part of our work that doesn’t come undone in a few hours! I have a spinning wheel that I haven’t used much since my children were born. Right now it has a piece missing because of those dear children! I need to get it going again, though. Not because I think there are any merits to spinning my own yarn over buying it, or even that it’s cheaper, but it’s more relaxing. I haven’t spun for probably close to 18 years, but I remember that about it. The rhythm, the sound of the whirring wheel….you don’t have to concentrate on anything or you can think great thoughts if you want while spinning. (That is, once you’ve learned it and practiced it a bit!) And your hands get nice and soft just from the natural lanolin in the wool! Different forms of needlework can be viewed as tedious or therapy. When my husband was in the ICU after his serious accident, I was knitting a triangular shawl that is super easy–no counting and straight knitting. I could sit and visit with others while waiting to see him, and yet my hands were productive. There is something comforting, something soothing about working with your hands, especially during a crisis. I went on to make my four oldest daughters shawls over the next year! Cheap therapy, I say! And believe me, I’m not "Super Knitter"! One daughter’s shawl has a nice small hole in the center where I slipped a stitch and didn’t find it until I was done! Keeps me humble! Quilting used to be a way to make something useful, to be a good steward by using the good parts of worn out clothes (and making a "memory quilt" in the process! ), to keep hands busy in a potentially stir-crazy time (cabin fever, anyone?) and in better weather an excuse for fellowship with others. We traded all that for a Wal-Mart comforter in a bag at $29.99. I think we got ripped off. When I finish something, even if it’s a bit lopsided or has a hole in the center of it , it is such a sense of accomplishment. A satisfaction that just picking up a scarf at Wally-World doesn’t bring. I just wonder if all the stressed out women found one outlet for themselves, whether they ever mastered it or not, if it wouldn’t help us all be in a better frame of mind. I take my knitting everywhere. I don’t knit extremely fast, and usually have about 6 projects going at a time (to the chagrin of my very organized mother-in-law–love ya, Mother! ), but that’s okay. I’m not needing to clothe my family for the winter. It’s just my therapy. And we get something out of it, too! See what I mean? What do you get out of paying somebody $100 an hour to listen to you?! If you really need to talk, come on over and I’ll only charge you $25! Or maybe I’ll just pour you a cup of tea in a nice teacup and set you up with some needles, yarn, and teach you this easy triangular shawl pattern! If you remember that the goal isn’t a polished product to sell, but just a sweet labor of love (and therapy for you!) for someone you love–or maybe even something special just for you– it makes it all the more fun! I might just have to get a quilt top going….. I don’t know why, but I seem to not be able to really get with it for Christmas until about now. I’m always about two weeks behind! Maybe it has something to do with three birthdays in the first 12 days of November and the recovery time from all that…I don’t know! 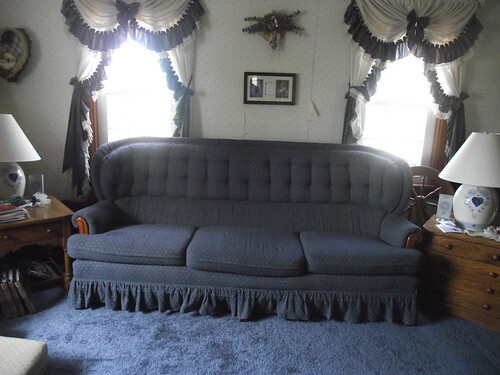 I have all this sewing I want to get done, but we still want to finish decorating the house. We got the tree done the week after Thanksgiving, but everyone’s been so busy that we haven’t taken the time to get the rest of the stuff out. Sew–I mean so–we’re taking a break from the machines and seeing what we can get done tonight, and finish the rest in the morning. We’ll put on some Christmas music (probably Elegant Christmas by Elegant Music–their arrangement of Troika is one of our favorites!) and maybe even have some hot chocolate! Oh, I forgot. We’re out. Um…think they’d mind spiced chai?! The past few days have been quite stressful. Oh, not fighting crowds and traffic, as I’ve done most of my shopping at the click of a mouse, but coordinating 7 Christmas lists is always quite daunting! (The boys are at the mercy of what my husband and I deem appropriate for them. Next year the now 3 year old will probably understand and have his own "Christmas list"!) Especially when you find out the tripled star items are either unavailable at this time or backordered until April of ’08! I also had to call Paperwishes’ 24 hour customer service number to see if I had actually submitted the order, only to find out that "24 hour customer service" has been outsourced, like so many things are, and the best they could do is take a message and have someone call me in the morning! (Of course they’re on Pacific time, so that meant about noon today!) Oh, by the way, I did place the order. How could I not know? For one, there was no e-mail confirmation. For two, I was trying to get this done without anyone seeing it–which is quite a feat since the computer is in the family/dining area, and although everyone was happily on the other side of the house, their "radar" kicked in and all of a sudden they needed my advice on projects or needed my assistance on something (like refereeing), or….you name it! So, in the rush of trying to accomplish the most before being seen, I must have closed it out before printing my receipt/confirmation! Well, at least I didn’t have to pay express shipping (yet)! I had to do that one year for most of my orders, because everyone moved up their dates from the year before, or I didn’t read the small print under "Delivery guaranteed by Dec. 24". Small print reads: extra shipping costs may apply. I read small print now! So I can say most of my shopping is done. Still have some stocking stuffers to get–although I don’t know why I bother. By the time I get to put my stuffers in, the stockings are stuffed from the other stuffors stuffing in their stuff! And there’s still my husband….at least his list isn’t so hard. Just a few items. Nothing triple starred. Simple. About the only thing that is! Time to find out if everyone’s done with their chores so we can get at least a little decorating done. Then maybe it will feel a bit more like Christmas. And somehow I’ve got to break the news to dear, dear laid back husband that his sweet, sweet 3 year old son pulled the towel bar sort of off the wall in the upstairs bathroom. And sort of pulled some of the wall with it. I guess it lasted almost a year before something had to happen in the new addition! Maybe we can decorate around it….a garland maybe? Think I’ll go bake some cookies for the troops!